This was my 6th year of attending this excellent convention! 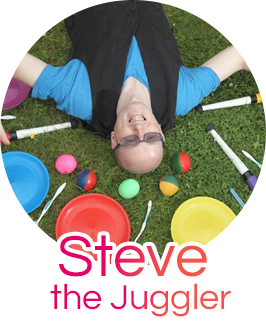 As I am unable to attend the British (Nottingham) and European (Greece) this year due to other commitments, this might be the best chance of the year to get some juggling practice done! I travelled with Allen Goldie (Tartan Juggler) to the event, only getting lost near the end of our journey and ending up at Ibrox Stadium! There was approx 10-15 people in the downstairs 24hr juggling hall when we turned up, and they were enjoying refreshments and catching up with each other. A few of us got straight into practice mode, and soon everyone was joining us! The upstairs hall opened later on in the night, but for most of the weekend, it wasn’t really utilised as most people seemed to practice downstairs. I had the large downstairs hallway all to myself for sleeping, which was surprising as there was tons of room for other people, but I wasn’t complaining! It meant that when I was resting, and just chilling out, that I could chat to people who were passing by and strike up some good conversations! 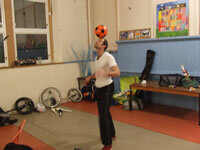 Juggling aims for this year were once again to improve on my 5 ball juggling. I also wanted to practice with lots of other items as I rarely find the time or enthusiasm to practice as much as I used to, and there isn’t a regular Juggling Club I attend at the moment. It was good to catch up with Max Marshall and Doc. We chatted outside while practicing a little glow juggling for a short while before it got way too cold! Unknown to the organisers of this years Convention (a new team instead of Graham Benson who is usually in charge), we didn’t have anywhere near the same amount of space in the Science Centre when we turned up for our weekends practice on the Saturday morning. This led to a general lack of enthusiasm to practice juggling and also to resentment that the Science Centre just didn’t seem to even want us there, unlike their friendliness in previous years! The main reason for lack of space is that the Science Centre has undergone a change and the main entrance area now leads straight into what was the fantastic atrium area that we have enjoyed using exclusively the past few years. This should have been communicated to the organisers before turning up on the Saturday expecting eveything to be the same as usual. There were only 2 vendors this year (Beard and a Poi stall) so there was a bit more room in the Clyde Room, but it was still very cramped. Eventually throughout the weekend, we were able to push the barriers out further and further and reclaim some juggling space! I had just began selling a brand new product called Propellor Poi. It glows in the dark and is powered without use of batteries! I showed it to lots of poi spinners during the weekend and they all seemed to like it and want to know where to purchase it from! 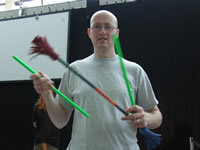 Devilstick workshop – I learned a couple of new tricks (mainly traps). George the Juggler then gave me some advice later on to improve my traps even more. 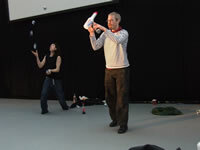 Bill Berry’s 3 ball workshop was very inspiring and even though the things he asked us to do were simple (such as making as high a pattern as possible) it just went to show that sometimes we are not in as much control of our 3 ball juggling as we would like to think! Lots of tips to make 3 ball more fluid and connect tricks better. The Ceilidh seemed to go well. Rerr Terr are a good Ceilidh band. There was always a packed room when I looked in, but I was far happier to practice juggling in the downstairs hall. I found a group of people from Aberdeen Street Entertainers Club trying to play keepy uppy using their shirts, and so I introduced them to Beach Flingo which we thoroughly enjoyed playing for large parts of the weekend! The Public Show had to be moved to the Clyde room, and it wasn’t an ideal location, but the best was made of the situation. My wife Rachel came through from Stirling to watch the show with me. As my camera had no battery power, I don’t have any photos from the show. My memory is therefore slightly hazy as to what some of the acts did, so let me know if there are any mistakes! Little (baby) Andrew Benson – what a beginning! Miles was the compere for this evening and done a good job. A great poi routine including some throws. Accompanied by an excellent drumbeat and backing track. Good numbers juggling routine set to music. Highlight of the show for me! A well thought out and funny clubs and hat manipulation routine done to the James Bond Theme, with lots of movie jokes chucked in at the right moments! I have now seen this routine many times at various conventions. It is still great, and this time they have added a new colour changing ring trick into the routine which made it even more impressive! I realise that it is getting far harder for the organisers of the Public Shows to find acts that most of the jugglers who attend other conventions haven’t already seen, so I would like to say well done for getting the mix just right with established acts and lots of local talent (especially Sarah and Sam)! I would have liked to see Azrelle perform as she is usually among my fave acts! We had a little bit of practice time, then were chucked out in the freezing cold to watch the Fire Show. I managed to catch up with my friend Michie who I had forgotten actually works at the Science Centre! Doc and some other jugglers tried unsuccessfully to jumpstart a car in the car park, but the battery was well and truly flat! Only one Renegade this year, and I signed up to be the opening act! Sarah Bizkup was the compere and did an excellent job. Songs Mix Routine: I had planned on doing my Songs Mix routine last year (which I wrote especially for the StAnza Scottish Poetry Festival as it mixes words and movement), but couldn’t find a tape player, so it was a year late in premiering at a Juggling Convention! It was well received. Snooker Ball Joke: I read a joke a while back which involved snooker balls, and I managed to come up with a way of telling it while juggling 5 balls, and it went down well also! 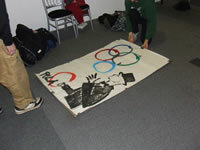 My Favourite Act was Miles doing a Cigar box routine using 2 cigar boxes and a balloon! Ingenious! Jonathan Root congratulated me after the renegade for my routines. This was particularly pleasing as I had attended a Team Rootberry comedy workshop a few years ago and Jonathan has e-mailed me loads of comedy notes afterwards! Marco Bonissimo posted on rec.juggling “I had to laugh a lot seeing the first act at the renegade”. so I am very happy and enthused to develop some more routines for future renegades! The 3 haggis world record is now 14m 12secs as set jointly by Luke Burrage and Bill Berry. For the 3 haggis endurance, I managed to last until the final 4 jugglers this time round, but dropped at around the 5.5min mark! Jonny and I won the stredging for the 4th/5th year running despite fierce competition! Glad I hadn’t purchased this years convention t-shirt as I was able to claim it as a prize! I also won the devilstick propellor game, managing to defeat the mighty George in the final! Raffle could have been done at the same time as the 3 haggis endurance just to keep things flowing a little smoother. It would also have been more appreciated if we got to quickly pick our raffle prizes instead of being handed items as it meant that most people received something that they weren’t keen on getting! I got a set of absolute rings from Beard, but as I sell them in my online store, they were just added to stock – thanks Beard! Allen won a set of DX Balls which I would have been able to choose way before his number had been called! A big well done to the hard working team behind this years convention! The only downside to the convention was the lack of space at the Science Centre. Many people have commented that they would be quite happy to just stay at the Kinning Park complex all day and everything could possibly happen there? I would personally prefer to use Science Centre during the day if a deal can be arranged where we can get a decent amount of space as in previous years! I feel encouraged by the response to my renegade acts this year, so I plan on coming up with some new material to perform next year! Another great convention, and a great chance to meet up with old friends and make some new friends also! Bring on next year, wherever the venue may be!